I must admit that the Discworld novels are starting to blur in my mind. I've only reviewed four of them on this page (and that's including this one), but I've read almost all of them, I just did it before I started reviewing. The reason that I stopped was simply that I overdosed. Anyway, the thing is when you've read maybe twenty books in a series (this is book number 26), it very hard to be surprised in anyway. 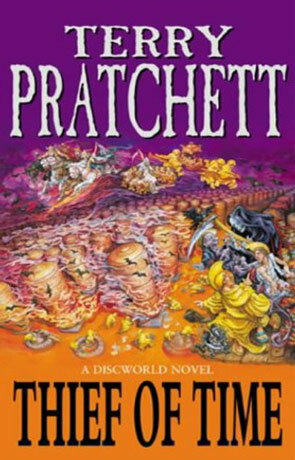 It's has been a long time since a Discworld novel has brought anything new to me (and this isn't an exception). So I've revised my expectations. I expect nothing more than entertainment while I read it, hopefully including a few good chuckles. I expect no lasting impression and no deeper meaning. Thrush armed I've brought the three latest Discworld novels (this one, The Truth and The Fifth Elephant). It's impossible not to have expectations (not without major brain surgery), but it's is possible to adjust ones expectations and a good thing it is. I enjoyed this book all the way through and it managed to hold my attention, even in the most distracting of surroundings. The Auditors are back and they do not like what they are finding on Discworld – Which is mainly chaos and all kinds of similar byproducts of intelligent organic life. The Auditors are very fond of sticking to the Rules and even fonder of predictability. They soon decide that stopping time would be good way to make everything predictable. In the other side of the ring we have The History Monk Lu Tze and his apprentice Lobsang. With a bit of help from Miss Susan they journey to Ankh-Morpork to stop the Auditors and their predictable plan. Contained everything I expected from a Discworld novel. Written on 29th July 2002 by TC.